I REALLY GOT INTO CYCLING in 1971 after buying my first good road bike. There was a lot to learn, so I gathered what books I could find. 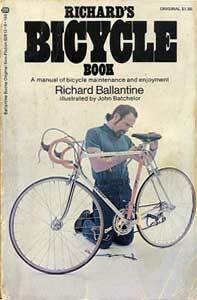 One, Richards Bicycle Book by Richard Ballantine, is still a favorite. Its now dog-eared and yellowed but I still look at it from time to time and always enjoy the writing and illustrations. If you can do it, the best thing is to outrun an attacking dog. Often this is not possible, but 99 times out of 100 there is still no serious problem. . . . He is normally friendly. All you have to do is stop, dismount, and face him directly. This is a good tactic that usually works, and Ive used it plenty. Add the command No! and youve really got something. Even fierce dogs will halt if you can say it menacingly enough. Using this approach, Ive ridden safely past all manner of dogs. So I felt ready recently when two rather ferocious toilet lappers charged me on my evening commute. One was a smallish German shepherd, the other a heavily muscled Rottweiler/Labrador mix. Have confidence. As a human you are one of the largest mammals and a formidable contender in a fight. I unclipped my right foot and stopped, straddling my bike. I stood tall, squared my shoulders and shouted, No! screwing my face into a mask of terror. It didnt work. Quicker than an endo, the mean mongrel was on me. She lunged, catching my right leg just above the knee with both fangs. Dont cower or cover up, because the dog will only chew you to ribbons. Attack. Any small dog can simply be hoisted up by the hind legs and his brains dashed out. With a big dog you are fighting for your life. If you are weaponless, try to tangle him up in your bike and then strangle him. I studied my foe. This was no lap dog to be hoisted and dashed. Perhaps from tasting my leg or maybe from a lifetime of getting beat, this fiend wasnt about to retreat. I faced pure evil. Her glassy eyes rolled back in her skull. She crouched, bared her teeth, and blitzed again. It may sound stupid, but I tried to punch the beast in the head. She dodged and snapped, snagging my forearm with her teeth as it passed. Desperate now, I picked up my bike and swung it back and forth, pendulum style. This forced her to retreat slowly into a nearby driveway, still snarling. I wasnt eager to get too close again. But I was charged with adrenaline from the encounter. I was angry that this violent dog was out, and I wanted to find the owner and scream at him. So I inched into the driveway holding my bike as a shield, yelling. A man appeared and managed to grab the dogs collar and force her into a shed. Still rattled and mad, I started accusing the poor guy, who finally made me understand that the dog belonged to someone who attends a church in the area, brings his pet along, and lets it run free while shes at the service. The man brought out a medicine chest. After I cleaned and patched my leg, we called the owner and the authorities. The former was deeply apologetic and assured me the dog had all its shots. The latter said theyd had several complaints about a dog that matched the descriptionand theyd impound her. I never found out what happened. The animal shelter was too busy to get back to me. On my commute now, I pray the dog doesnt appear. I havent seen it, a good sign. Maybe the owner finally keeps it at home. I sure hope so. The next cyclist might not be so . . . uh . . . well prepared.